Every competition comes with rules. At the Havana Club Grand Prix, one of them is that out of the forty bartenders taking part in the semis, only three will make it to the final day of competition. And so it was that at the end, there were three men standing on the podium, anxiously waiting on the jury’s decision. Earlier in the evening though, president of the jury Henry Besant and Havana Club International Brand Ambassador Michael Menegos decided to honour a fourth man: Japanese bartender Hirohito Arai. You see, Arai-san made quite an impression on the jury the day before but one thing failed him: time. Indeed, every competition comes with a time limit: in La Havana each bartender was given ten minutes to present his two drinks. If one takes more than the allowed time, the penalty is substantial. And Hirohito’s performance was so good that what prevented him from going all the way might very well have been his timing issue. Alas, rules are rules… But Hirohito Arai felt so bad about it that he went to see the jury and asked its president to let him take part in the final. Not as a competitor, no, just to showcase his skills and his drinks whilst respecting the imparted time. Of course, that wasn’t possible, but his dedication to his craft moved Henry Besant and Michael Menegos to make a special mention. “I was very moved that Michael and Henry introduced me in front of everyone at the Final”, says Hirohito, “it made me very happy”. Hirohito Arai’s career started in 1996, when he started working as a 19 years old apprentice alongside his father in the family bar, Nekomataya, in Ashikaga. An hour away from Tokyo, it’s a picturesque town sometimes known as the Kyoto of the east because of its cultural significance – it boasts the oldest school in the country and a few important shrines. And people there care as much for century-old traditions as for more recent imports: Nekomataya, now run by Hirohito, offers fifty seats and, come the week-end, it’s not easy scoring one. Japanese bartending and cocktails, so popular the world over, is in brilliant health at home, even away from metropolises such as Osaka and Tokyo. In between his stints at Nekomataya, as young bartender first and then as the owner, Hirohito Arai went to Yokahama in 2005 to take an apprenticeship under Kyotaka Kobayashi, a very important name in Japan – he is the Nippon Bartender Association 1999 champion and owns a bar in Shanghai, where there is a Japanese bartending craze. Heritage is a very importance concept and Hirohito took the best he could from his mentors. 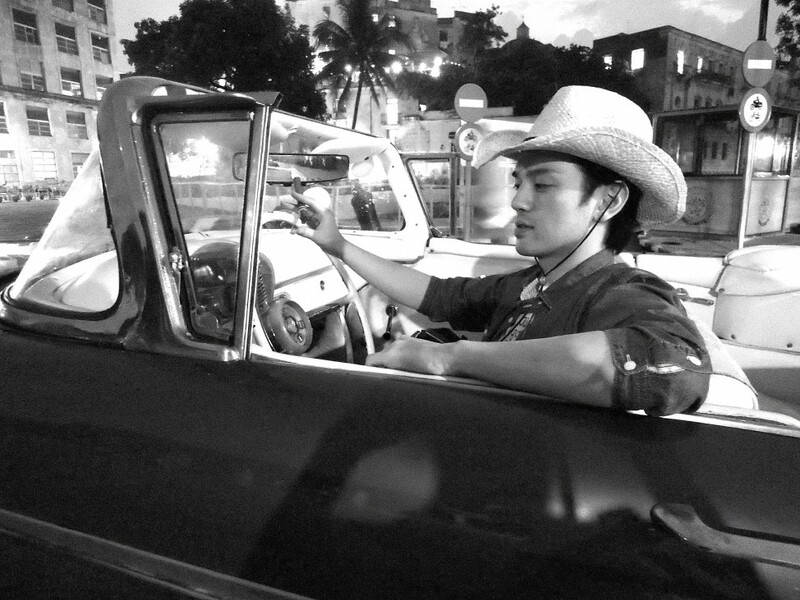 At the core of his work lies a concept he says he has inherited from his father. He calls it “enjoy cocktails with joy”. “I put the very best of myself in each cocktail I create, without neglecting any. Because, this could be just one cocktail out of hundreds for me; but for the customer, this could be the first or the last cocktail. Sometimes I cannot talk because I am busy, but especially at such a time, a single cocktail I create is the very expression of my passion and sincerity for my customer”. Each cocktail being as important as the previous or the next one, you will never get Hirohito to tell you which cocktails he prefers making. The question is irrelevant: cocktail-making is all about creating a bond between customer and bartender through the perfect drink. In such a relation, the preferences of the bartender have no place. Some would say it’s an attitude a few bartenders would be inspired to emulate… But then if the bartender doesn’t have a preference, what about clients? What drinks do they order most often? “We do have a menu, but most of our customers ask me to create something”. This they call “omakase” (“I’ll leave it to you”). “It is my style to create customized cocktails that suit the customers taste at that particular time, which are never the same from one person to the other, just like prescriptions for medicines.” Just stop and think about this for a moment: the sheer amount of creativity needed to make this work every night is staggering. What is Hirohito’s method? “First of all, I ask the customer their flavour preferences and how they are feeling physically (if they are hungry or if they already had drinks, etc.). Then, I decide what to make, focusing my thoughts on elements like seasonality of the fruits, balance of flavours, and “wow” factors, and then I create the cocktail imagining the face of a happy customer enjoying it.” And what do Japanese cocktails have in common? “Their exquisitely delicate flavours”. In La Havana, Hirohito wowed the jury with drinks where Japan and Cuba met. Take his Cuba Libre re-interpretation, called the Jelly Cuba River. Using Selecion de Maestros as a base, Hirohito first made a on the spot Dr Pepper jelly that he put in a mould for Japanese sweets and squeezed in a traditional cut glass. The rum and a lime wedge were served on the side and it was up to the customer to add the ingredients in the glass, so that they could adjust the alcohol level or the acidity of the drink up to their preference. In Hirohito’s words, the customer is then creating and tasting his Cuba River simultaneously! His Japa-Daiquiri was equally eye-catching, prepared as it was to evoke the traditional Japanese wedding ceremony. Hirohito encountered problems bringing over some of the required ingredients and had to make last minute changes to his recipes (using Yuzu confectionary instead of fresh Yuzu juice or Dr Pepper for cola, for instance). That he still managed to impress everyone with his cocktails is testament to his talents. Back home, Hirohito is also a tv personality, introducing cocktails to a wider audience. But his aim in life doesn’t have much to do with the spotlights: “It is my goal to one day become a bartender like my father, and my master, and also to keep training younger generations of bartenders”. 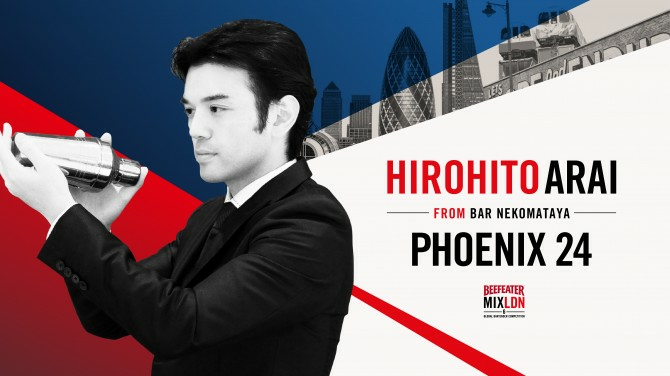 Humble, dedicated to his clients, extremely creative: Hirohito Arai is quite the bartender. We hope and trust that in a few years, when we will talk to the Japanese candidate at the Grand Prix, he will tell us about his master Arai-san. Pour all ingredients into mixing glass and stir with spindle mixer. Pour into ice-filled shaker and shake. Strain into traditional Japanese wedding ceremony cups. Garnish with Rakugan, serve green tea on the side. Pour cola into a pot and mix with kanten powder. Once firm, place the cola jelly into a Tokoroten (a Japanese jelly desert) mould. Squeeze the jelly into a Japanese traditional cut glass. Serve with soda powder, lime and rum on the side. Drinker can thus adjust level of rum, lime and carbonation.